For the last 38 years, under the tutelage of Directors Anna Maria and Brian Clement, hundreds of thousands of people have participated in the 3-week Life Transformation Program. They learn these life-giving concepts and experience the gentle detoxing that happens with the organic Living Foods diet, fresh wheatgrass and green juices, and alternative therapies that are offered daily. Set in lush, tropical 50-acre setting in West Palm Beach, Florida, guests from all over the world benefit from health and nutritional counseling, non-invasive remedial and youth-enhancing therapies, state of the art spa services, inspiring talks on life principles and a tantalizing daily buffet of enzyme-rich, organic meals. Our mission is to assist people in taking responsibility for their lives and to help them internalize and actualize an existence free from premature aging, disease, and needless pain. Hippocrates teaches us the benefits of an organic, vegan ‘Living Foods’ diet, which offers the highest protein, vitamin, and mineral content, as well as essential fatty acids, of any food on earth. Consuming organic and non-GMO foods are the most important first steps to take. Toxic chemicals sprayed on our foods must be avoided; not only for our health and that of our children but for the environment and our precious bees. Always read your labels and choose ‘Certified Organic’ products and produce, and look for ‘GMO-Free’ on the labels. Organic ingredients in our skin care products, and even in our clothing are just as important, as everything we put on our skin is absorbed into our bodies as if it were food. Consuming meat has much detrimental health, environmental and moral consequences. Current ‘factory farm’ practices of overcrowding, water waste, and pollution, administering of antibiotics and growth hormones, along with the torturous treatment and slaughter of animals is a serious consideration for anyone contemplating switching to a vegan or vegetarian diet. On a vegan diet, there are no animal products whatsoever; no fish, poultry, eggs, pork, beef or dairy products. During our informative educational classes at the Institute, we learn about the hundreds of conclusive scientific studies that prove how these foods are detrimental to our health. They have been shown to be the cause of many of our current health crises such as obesity, diabetes, auto-immune diseases, heart disease and cancer. We receive all our vitamin, mineral, phytonutrient, protein and essential fatty acid needs from organic sprouted seeds, beans, nuts and grains, green leafy vegetables, micro-greens and wheatgrass juice. WHAT, NO DAIRY OR SUGAR EITHER? It’s interesting to consider that humans are the only species that drinks milk beyond infancy, and none consumes the milk of other species. Instead of cow’s milk, a vegan diet includes delicious nut milks, which are a great source of plant-based protein and healthy fats. Nut cheeses are also a wonderful substitute for dairy cheeses and blended frozen fruits make a refreshing sorbet that replaces ice cream. ‘Sugar is tantamount to a drug, and the addiction to it produces much more widespread illness and disease in humans than any other legal or even illegal drug, with the possible exception of tobacco’…. 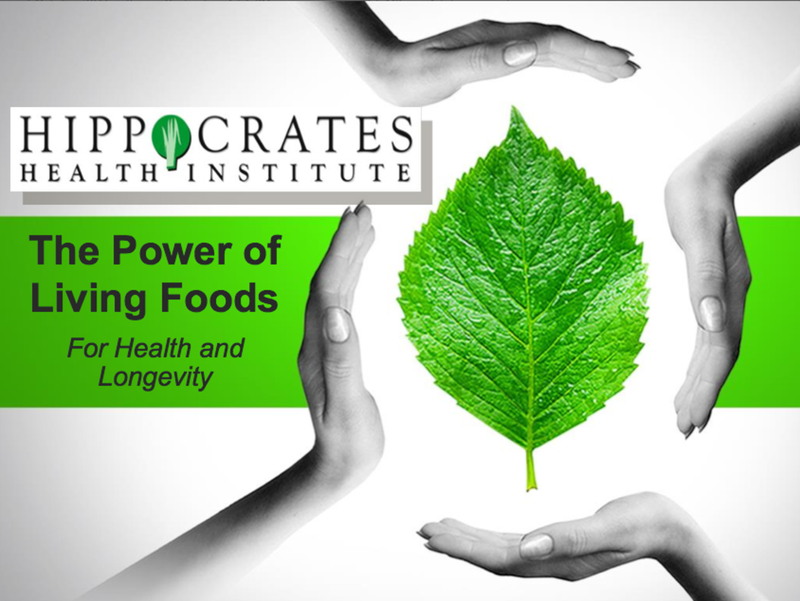 Once we understand how these foods can be detrimental to our health and longevity, and why we believe a vegan diet is the healthiest diet there is, we learn how Hippocrates takes the vegan diet one step further. •They have demonstrated, for over six decades, how the ‘Living Food’ diet or ‘Raw Food’ diet is so powerful in resorting vibrant health to all who follow the simple concepts. •It is simple: cooking food destroys precious enzymes that protect our health. Sprouted and raw ‘Living Foods’, are veggies, nuts, seeds and grains that have not been cooked above 110 degrees. Since the food has not been cooked or processed, the naturally-occurring enzyme activity remains available to aid the body in proper digestion and nutrient assimilation. Chlorophyll–is the energy of the Sun captured in the life of the plant. It is the first product of light, and therefore contains more light energy than any other element. It is often referred to as ‘the blood of the plant’. detoxifying and fortifying the body. Disease cannot survive in an oxygen-rich, alkaline environment. Hemoglobin and Chlorophyll share almost the same molecular structure, which makes it an excellent blood builder and purifier. Along with wheatgrass, sprouts have been the foundation of the Hippocrates program since its beginning. They are powerhouses of concentrated nutrition and life! They have a higher enzyme content and contain hundreds of times more of easily digestible vitamins, minerals, antioxidants and amino-acids (protein), than their full-grown counterparts. Beans, nuts, seeds, and grains are all excellent sources of high-quality nutrition when sprouted. The Wonders of Wheatgrass Juice! Freshly juiced Wheatgrass is the most powerful cleansing and detoxifying tool in the Hippocrates program. -Wheatgrass juice is 70% chlorophyll; one of the most highly concentrated forms of the sun’s energy. -Just 2 oz. of Wheatgrass juice is nutritionally equivalent to 5 lbs. of fresh veggies. -And there’s so much more! Along with a dozen varieties of sprouts, greens and chosen side salads on our daily meal buffet, mineral-rich vegetables from the sea are another important addition to the Hippocrates diet. They are used as a supplement, in flavorings and as a nutritious substitute for salt. Get a happy move on! Exercise, movement and calm are important parts of the program, and there are many different class options to choose from every day. Hippocrates’ state-of-the-art gym, as well as ozonized therapeutic pools and steam and infrared saunas, all help round out our physical activities, aiding in detox and deep relaxation. We love our outdoor gym!It’s a combination of a great workout with fresh air and singing birds to accompany our efforts. All this and more awaits you at Hippocrates.